You may choose one of the pre-set colour combinations by clicking "Request a Quote"
Or design and order your own colours on-line by clicking the express yourself button. Premium grade 1.4~1.6mm shrunken grain race grade leather, supple yet extraordinarily strong. Flexible stretch panels are fitted behind the arms, and waist and above the knees. 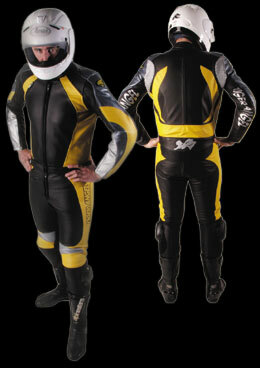 Anatomically correct cut suitable for sports and sports/touring bikes. Full length, 360 degree, triple sewn zip joining the jacket and pants; and the generous overlap means reduced drafts. Sport-X lining - durable, comfortable and moisture wicking for exceptional comfort. Full Body Defence System protectors in the shoulders, elbows & forearms, hips, knee & shin. Airflow dimple impact pads protect the back and collarbones. Impeccably sewn using the offset top stitch method. Zip pockets: Two hand pockets, inside chest, pants.